Some of the links below are affiliate links. Thank you for supporting Southern & Style by using these links at no additional cost to you. It has been one heck of a weekend (one heck of a month, actually) and it's thrown me off my blogging/social media game...but you know what, I'm not even mad about it. This weekend, Alabama had record snowfall-especially in my part of the state where we had from 10-13 inches of snow...totally unheard of in Alabama! A lot of people lost power, including my family and I'm going to have a post going up this week about why that's such a big deal, but basically it was a weekend that forced me to dial back on putting up posts. It was enjoyable, but now I'm back to the holiday hustle! I told you Alabama was a winter wonderland over the weekend! This shot was actually taken Sunday evening at sunset, so the snow had begun melting (it started on Friday night), but it was still so pretty. There will be a full post with a lot of the wintery-snowy shots I took, but I thought this might tide you over! 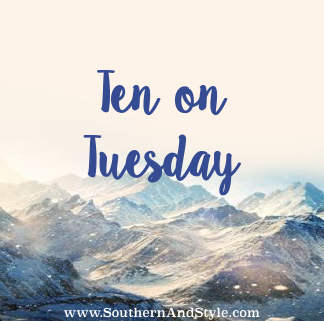 I really enjoyed Easily Inspired's post; Coping with Country. If you've been reading around these parts for a while, you know I'm a massive country music fan-it's pretty much all that I listen to. That post totally resonated with me because it has different playlists of country music for everything you're going through from heartbreak to life changes. It's good stuff & totally worth checking out. This is a product I've pretty much raved about for...maybe three years now? I worked with Exuviance back when I first started Southern & Style (anyone remember when it was Southern Stylista?!) and I've fallen in love with every product of theirs I have ever tried. But this one-the Performance Peel is a favorite & every time I see it on sale at Ulta or wherever, I always pick it up. This is something I use about every other week, depending on how the texture of my skin is doing at that point in time. I love that it helps my (giant) pores reduce their size & it's a game changer for my skin texture. It also has improved my skin's tone & made it seem more bright, which I appreciate. 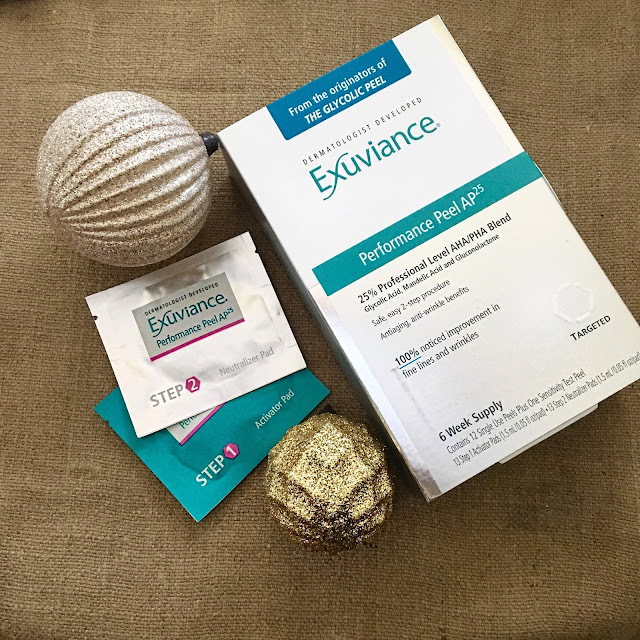 Basically, I'm trying to stay looking young for as long as possible & the Exuviance peel does that for me at under $80. I don't know about where y'all live...but I can't even get one single peel for less than $100 at my local medi-spa, so this is a great deal & you can do it in your pajamas at home on your couch in less than an a half-hour. P.S. I think this would make an amazing Christmas gift for the skincare lover in your life-or if you're trying to introduce someone into skincare this is a great first step! You can find it on Exuviance's website or Ulta! If anyone wanted to know what to get me for Christmas...Nichole Kidman & Keith Urban are selling their estate in Franklin, TN. But seriously, give me all of that natural light! 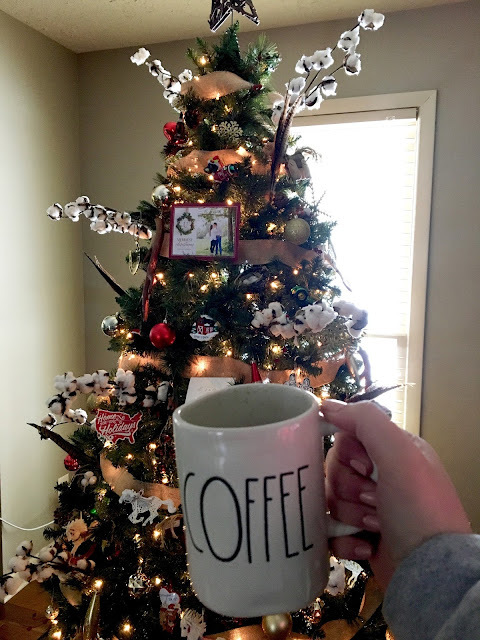 I have a Christmas home tour coming up on the blog soon, but I wanted to share a sneak-peek of our tree with you today because I'm so in love with it. It's a rustic mix of both pretty/themed ornaments and also some personal ones that we love. Also, is anyone else currently obsessed with Rae Dunn? I've liked it for a while, but never found any up until maybe last week when I was in TJ Maxx and found two mugs & a coffee canister. They're SO cute & fit our decor perfectly. Have you heard of the pickle ornament Christmas tradition?! This is one we had growing up & it was so fun to sneak down to the living room and try to beat my two sisters to being the one that found the ornament. It was one of my favorite Christmas traditions and I've already got a pickle ornament for my house-even though Chris and I don't play the game, we'll save that for when we have kids! I've started thinking about what gift guides y'all might still need as Christmas inches nearer and nearer. If you're the youngest, then you feel this list too-I mean, especially number ten. Having two older sisters ultimately helped me be the coolest. Has anyone else been on a Christmas music kick?! Lately, when working on blogging or anything else that I have to really think while I'm doing it, I've been listening to instrumental Christmas music on Spotify and it's so relaxing & is the perfect background noise. If you read my December Goals post, then you know it was one of my goals to reach 1,000 Instagram followers before 2018 and y'all-I made it! I know 1,000 isn't many to some, but y'all-when I started this little blog/instagram of mine all I wanted was an outlet to post things that really didn't fit on my personal social media accounts. I didn't want to bug my friends, family, or anyone else that might see my personal accounts with pictures of home decor or beauty items so this was my free space. I'm just so glad 1,000 people want to see what I have going on! Tell me below-if you're in social media/blogging, do you set number goals? I would love to know what your next goal is! Your tree is so pretty! I love the cotton picks! I absolutely love your Christmas tree! It is really unique. Good job done! I can totally relate to your goal of reaching 1k followers on Instagram. Congratulations on that! It's not an easy feat I know. I myself have been trying to get there but well, the struggle is real! I’m a little jealous you had snow (it snowed everywhere around us) but I’m sorry to hear you all lost power! That’s the worst thing about the ice and snow in the South! We just aren’t prepared for it. Congrats on reaching your Instagram goal!!! I seriously can't believe that the southern states got so much snow, and we haven't even had an inch yet where I live (middle of Iowa)! We were expecting more snow here in VA, but we hardly got any! Sorry you lost power, but at least you got to enjoy some picturesque views! It is SO crazy to see all the snow in the South. I live in Utah and we ALWAYS have snow by this time of year and there is NOTHING on the ground! Glad you guys survived it, though! I've been listening to alllll the Christmas music lately. I can't get enough. I'm excited for your home tour! I love seeing how people decorate for Christmas. Congrats on your Insta goal! That's awesome. Snow in the South!! So crazy! It snowed here in my part of texas for the first time in over 10 years! Congrats on reaching 1000 followers! We all know how growing our Instagram accounts can be. That's so crazy Alabama got that snow. I love when we get snow in NC. We had that much snow in Marietta, too and it was AMAZING! I loved it so much! The snow was absolutely magical! OMG SAME with the Exuviance products -- the more I try them the more I love them! Glad to see a fellow junkie! Also, don't they send the BEST PR packages?! Congratulations on your 1,000 Instagram followers! I do think that's quite an achievement!